A21 Gas Sampling System is designed to draw gas samples from ducts or other hard to access location, and deliver the sample to a gas sensor located in a more convenient location. The A21 Gas Sampler is an electrically operated gas sampler that is designed to draw a gas sample from a duct, vent stacks, enclosed space or hard to reach location and deliver the sample to a gas sensor (like the D12 or B12) that is located in a more convenient spot. It is best to locate the gas sensor on the vacuum (inlet) side of the sample system to ensure the gas concentration is not affected. In addition to the sampling pump, the A21 Gas Sampler contains the components necessary to insure reliable gas sample measurement. A flowmeter is mounted on the front panel to allow the user to adjust the sample flowrate to the desired value (normally around 500 cc./min). Internal to the system is a loss of flow detector that will warn of sampling system problems that could compromise the gas measurement system. An alarm light on the front panel indicates "loss of flow" while an internal relay can be used to indicate this alarm remotely. It's high quality diaphragm pump is operated by a brushless DC motor to provide continuous sample over long periods of time. These pumps are rated for over 10,000 hours of continuous operation, and the diaphragms in the pumps are able to be replaced easily when needed. The pumps will draw gas samples against a vacuum of up to 10" Hg. 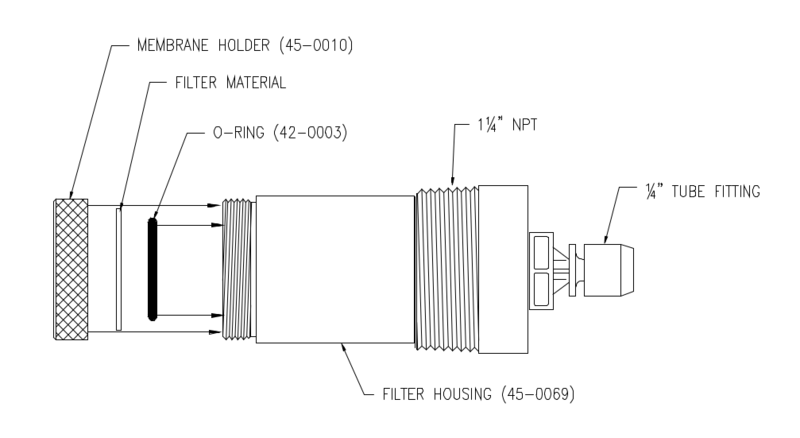 Inlet filter assembly (00-0703) - a special fitting is available with the A21 to insure that excessive amounts of dirt or particulate water do not enter the system. The filter assembly consists of an inlet body and replacement membrane filter held in place by a screw on cap. A membrane is installed at the factory, and a package or spare filters is supplied. The inlet filter assembly is designed for either insertion into a duct or pipe, or hang in an enclosed space. A 1 1/4" NPT pipe thread is provided near the pack of the housing to adapt to pipes or ducts. The rear of the housing contains a 1/4" ID soft tube fitting for sample line connection. The filter will require replacement every 2-3 months (possibly more frequently depending on the location).